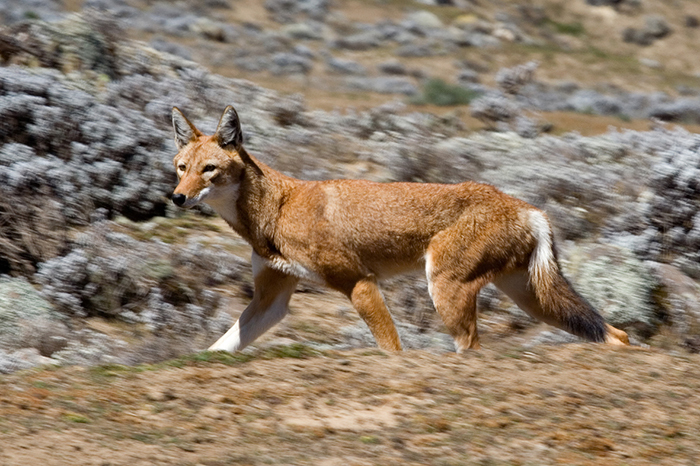 10 Nights traveling through southern Ethiopia: Learn to cook Ethiopian, farm to plate, organic preparation, pick coffee beans – buna melqem – in Yirgacheffe, hike to a Hammer village for a nightly dance, trek the Bale Mountains – home to Mountain Nyala, Ethiopian Wolf. Headquarters. The Ethiopia Commodity Exchange (ECX) is an organized marketplace, where buyers and sellers come together to trade coffee. During the afternoon session there is a free trade activity where coffee producers and exporters will attempt to consummate business deals. Our group will have a place in the hall and before the traders start their work, the marketing and communication Manager of ECX will give a brief explanation about the buyers and sellers doing their day to day activities. At 2:30 pm one of the tour participants will Ring the bell to commence the trading day at the Coffee Exchange. This evening you are guests at the Whole Foods Restaurant, where before dinner you’ll have the opportunity to meet the chef and help in the preparation of traditional Ethiopian dishes. 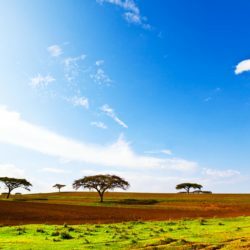 This morning board your 4x4 vehicle and drive south into the Great Rift Valley passing wonderful scenery such as Lake Langano to the town of Awassa. 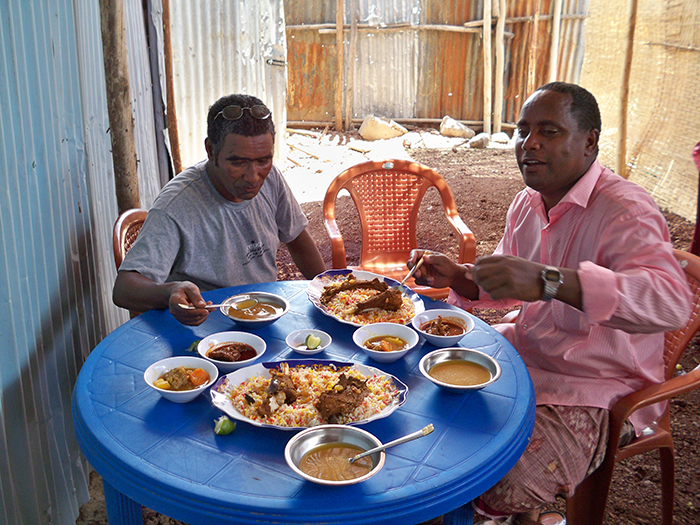 Enjoy lunch at a restaurant on the shores of Lake Awassa. Continue south to the small town of Yirgalem and drive to the center of Sidama Coffee Farmers Cooperative Union. SCFCU is a skilled organization with the responsibility of processing support, marketing, and the commercializing of coffee for 45 cooperatives comprising of nearly 87,000 farmers. It is well known for its production of garden coffee. Sidama produces approximately 35,000 tons of high quality Organic Arabica beans per year on 70,000 hectares of land. Explore the farm land walking through coffee farms which are homesteads. The harvesting period for the Sidama Coffee is from September to December. Harvesting is mostly done by family labor who hand-pick cherries which are sorted before pulping and sold to the primary cooperatives for wet processing. More than 30 percent of the country's washed coffee comes from the Sidama area, which is known for its floral flavors. Check-in late this afternoon at the Aregash Lodge nestled between coffee fields and lush vegetation. The bamboo thatched Tukuls are built in the style of a traditional Sidama Village decorated with vibrant colors. A delightful home base for the next three nights. This morning drive to the Yirgacheffe Coffee Farmers Cooperative Union. Enjoy a guided tour walking through the coffee farms. Then have the opportunity to participate in the daily chores and duties of a local farmer, each person paired with a local worker, learning by doing and understanding what life on the farm means. The Union represents 43,794 farmers and you will learn why the Yirgacheffe coffee is different from other Ethiopian coffee species in which these local farmers produce 10,000 tons of coffee per annum. Some of the farmers also produce 4,000 tons of Sidamo blend coffee. The coffee cultivation practice here is organic and the coffee trees are managed by hand and fertilized with organic matter. Also learn about the washed coffee process and the sun dry coffee process. At the end of your full day visit join some of the local farmers for a Yirgacheffe Coffee Ceremony. 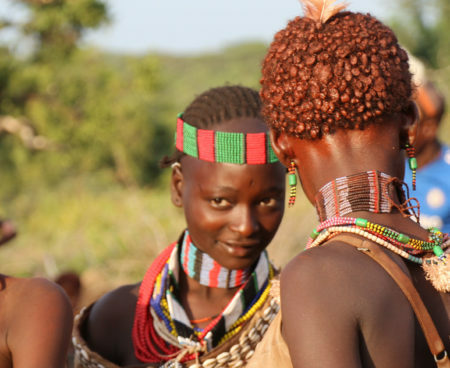 We leave the coffee regions of Ethiopia to venture south and into the Omo Valley. We visit the Dorze tribe and their village, famed for its beehive-shaped houses. The Dorze people are expert weavers and weaving is a primary profession for many Dorze. They are also farmers and use ingenious terracing of the mountainside to prevent soil erosion. Around their huts the Dorze plant gardens with vegetables, spices, tobacco and enset (false-banana or musa ensete). Participate in the process of making bread from the false banana or enset. And have the chance of tasting the bread with hot chili and a very strong local alcoholic drink, which the Dorze people take for digestion and anti-bacterial medication. 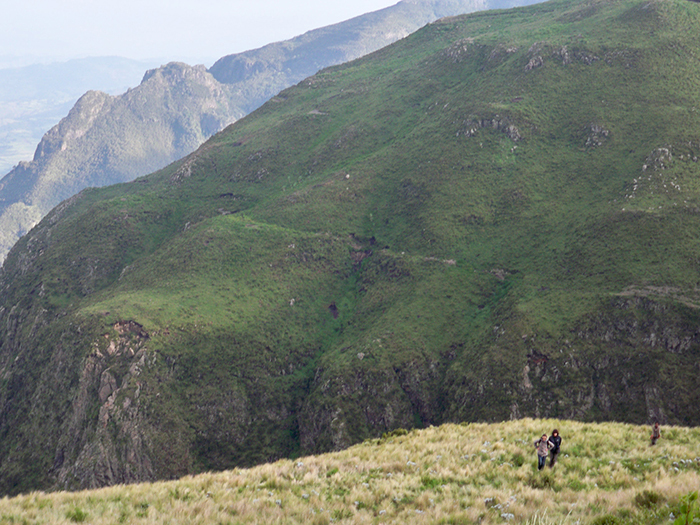 Our next village to visit belongs to the Konso. A pagan society, the Konso erect eerie wooden totems replete with phallic symbols over the graves of the dead and have numerous cults based around the breeding and veneration of serpents. 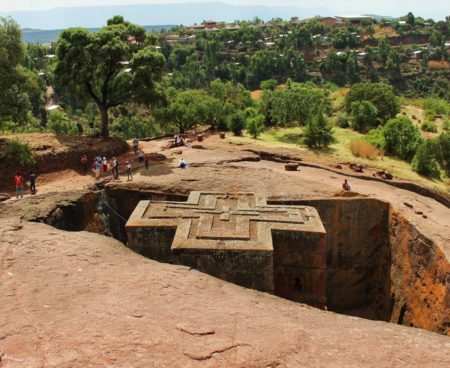 The cornerstone of Konso culture, however, is a highly specialized and successful agricultural economy that, through terracing buttressed with stone, enable these people to extract a productive living from the none-too-fertile hills and valleys that surround them. You will have lunch in the village, learning of the Konso cuisine and participating in its preparation. An excellent day to meet the people, take photographs with them and learn of a culture that has had very little outside influence. After lunch visit the Ari Village compound and learn how the local people process different foods and alcohol. Late afternoon arrival in Jinka, located at the foot of Mago National Park. Take a hike to the Ari village compound and enjoy dancing with the local people. We leave Jinka and drive to a Mursi village. 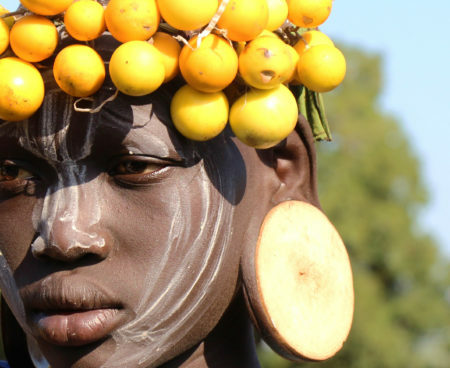 The tribe is renowned for the unusual custom followed by their women who, on reaching maturity, have their lower lips slit and circular clay discs inserted. We continue on to Turmi, through Dimeka, to visit the Hamer people and their village. Hamers have remarkable hairstyles made from ochre, water, and binding resin. They rub the mixture into their hair then twist the strands repeatedly to create copper-colored locks. This is a sign of wealth and welfare. Hamers are considered to be masters of body decoration. This day we drive to the Murulle area. Murile (also spelled Muelle and Murli) lies on the banks of the Omo River, and is a popular base for exploring this area. The two main tribes who live here are the Karo and the Hamer, both of whom practice scarification and have elaborate hairstyles. The Karo are experts in body painting, using clays and locally available vegetable pigments to trace fantastic patterns on their faces, chests, arms and legs. These designs have no special symbolic significance but are created purely for fun and aesthetic effect, each artist vying to outdo his fellow artist. Karo men also sculpt and shave their hair into extravagant shapes, with special ochre "caps" of hair usually containing several ostrich feathers. Late in the afternoon take a hike from your lodge to one of the Hammer people’s village. The Hammer people are famous for their overnight dancing, which is known as Evangadi. Tonight you will dance like a Hammer. On the return drive to Arba Minch visit the Arbore tribe who are known for herding cattle and depend on plant cultivation for their basic food. They provide cereal grains for neighboring tribes through trading partnerships. They are considered pastorals and have their own unique physical appearance with the women covering their heads with black cloth and known to wear very colorful necklaces and earrings. Body painting using natural colors are made from soil and stone. Traditional dancing is practiced by the tribe and wealth is measured by the number of cattle a tribesman owns. Early in the morning leave the town of Arba Minch and drive to Bale Mountain National Park. 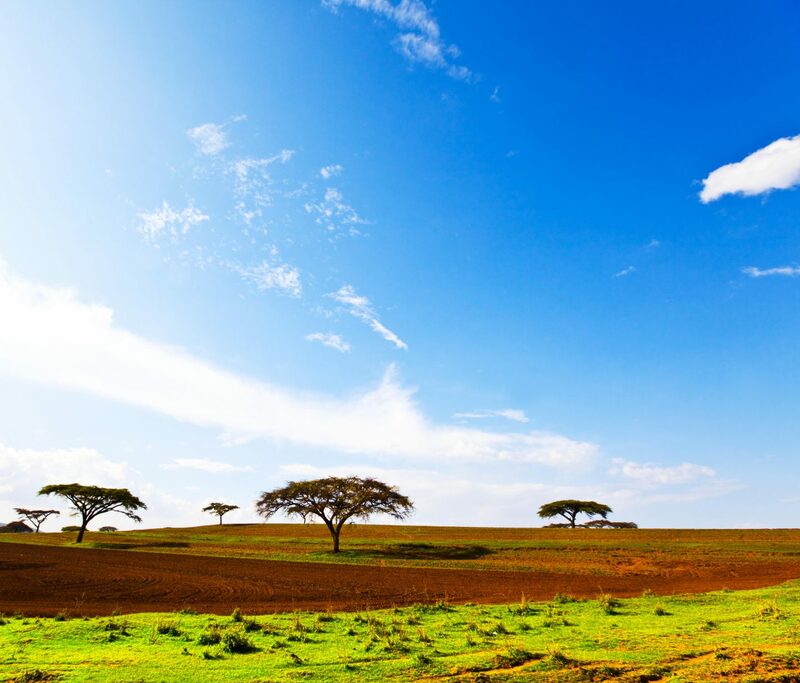 Ethiopia is truly a country a diverse geographical zones and as you leave the Omo Valley behind you will experience such changes, entering the majestic landscape of the south-eastern part of the country halfway through the today’s journey. Continue driving to Dinsho, the headquarters. Early morning, head to the Sanetti plateau. From the park headquarters, turn right and follow the main road through Goba and Robe to the plateau. 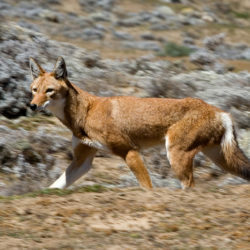 As the sun rises, the most endangered canid in the world – the Ethiopian wolf – begins to hunt. 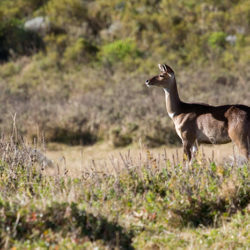 The Sanetti plateau is the best place in Ethiopia to see this elegant animal, and the winding road atop the plateau, one of the highest all-weather roads in Africa, is an ideal spot for viewings. 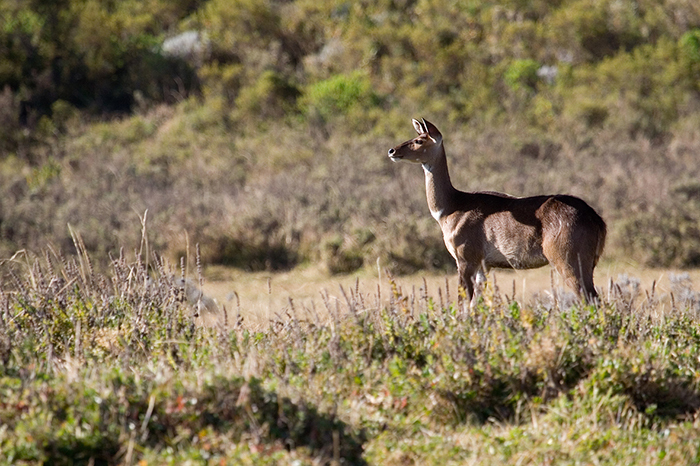 The plateau is crawling with rodents, the largest being the giant mole rat, found only in the Bale Mountains. Explore the area on foot, marveling at the lichen-clad rocks, indicators of pure air. Look to the sky for soaring birds of prey: golden, tawny and Verreaux’s eagles as well as the bearded vulture (lammergeyer), lanner falcon, and augur buzzard. Continuing again by car, you will pass Tulu Dimtu or “the Red Mountain” just 4km off the main road. This is the second highest mountain in Ethiopia at 4,377m. The summit is reachable by car or by foot in under an hour. As you reach the end of the plateau, you enter the Harenna escarpment, plunging more than 2,000m towards a vast tropical forest in just 8km. Driving down switchback roads, you’ll be treated to magnificent views. After passing through stands of giant heather the road takes you to the small village of Rira. 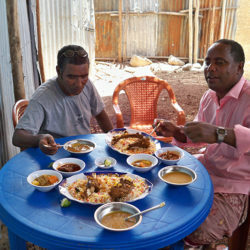 Stop for lunch and enjoy the local dish of ambesha and gomen (flatbread and steamed kale). Found at the base of the Harenna escarpment, Rira is the center for a bamboo forest walk and short waterfall hike into the stunning Harenna forest. During the day the group will meet researchers from Utah and Oslo Universities who are using the Bale Mountain Lodge as their base for the study of birdlife and the Bale Monkey. 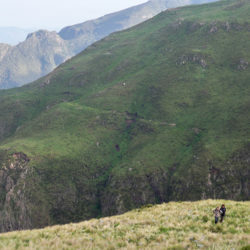 Learn about why this afro-alpine forest is so unique and the drive to conserve the area from deforestation, animal grazing and human impacts. This morning commence your drive to Addis Ababa and stop at Lake Ziway to view the colorful birds. 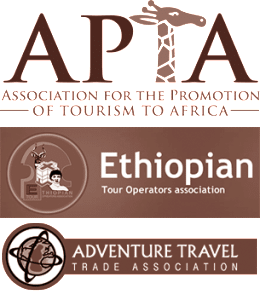 Upon arrival into Addis Ababa enjoy dinner at a popular traditional Ethiopian restaurant and transfer to the airport late tonight.